Empowered by an SLR tutorial, Muther captured a rainbow off Soufrière’s coast. SOUFRIÈRE — If the accolades are to be believed, then St. Lucia, particularly the town of Soufrière, is the epicenter of Caribbean romance. The World Travel Awards declared the island to be the Caribbean’s leading honeymoon destination six years running. It’s on Travel + Leisure’s list of the top 10 most romantic places to propose, and astute fans of “The Bachelor” will recall that Juan Pablo Galavis visited Soufrière for the season finale earlier this year. That’s just dandy for starry-eyed newlyweds and kissy-kissy couples looking to reboot romance. But it seems quite unfair that these amorous duos should have all the fun in Soufrière. What about us solo travelers who want a sliver of paradise? 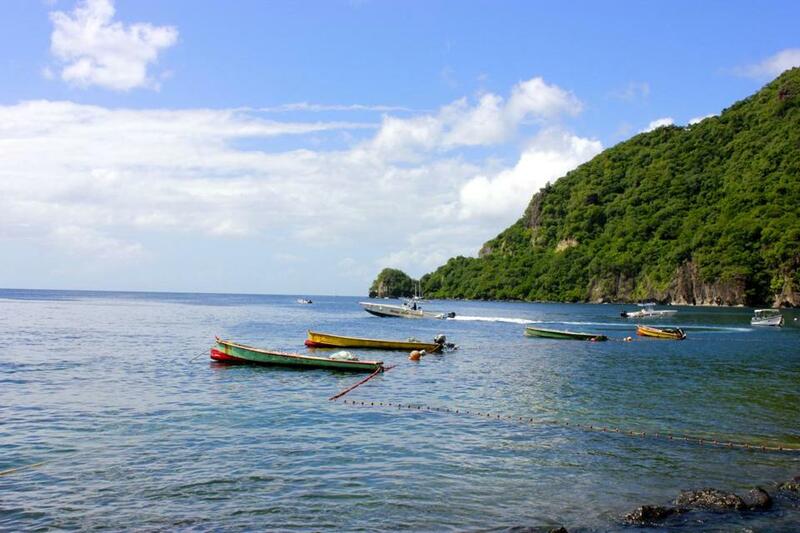 Soufrière, on the western coast of St. Lucia, is one of the most beautiful places I have ever seen. The lush, pointy Piton Mountains hug the coast and drop dramatically into the sea, creating an otherworldly tropical utopia. As a solo traveler, I could have headed north to the more populous capital city of Castries. But instead, I headed directly into the tunnel of love known as Soufrière, where I stood out like Katy Perry at an Amish barn dance. My biggest fear wasn’t contracting chikungunya from a mosquito bite, it was looking like that creepy single guy who goes to a couples resort and then sits by himself at dinner, making all the newlyweds depressed by his presence. Loser, party of one, your table is ready. 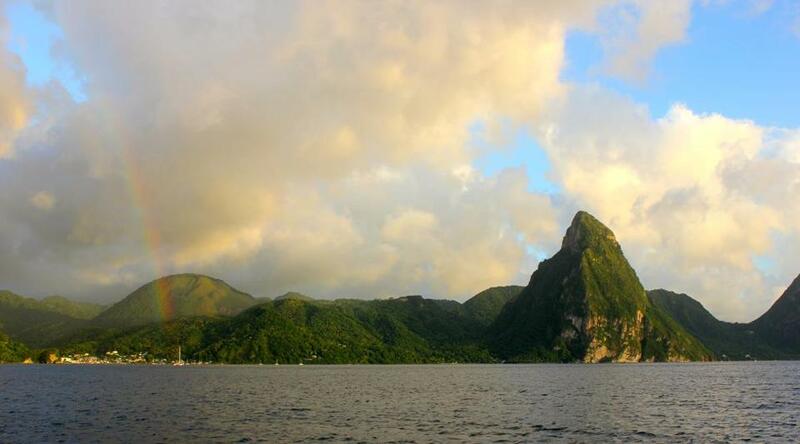 The anxiety seemed to be justified my first afternoon in St. Lucia as I climbed aboard a boat for a sunset cruise. I’m not being a dour Donald when I tell you that everyone on the boat was a newlywed — but me. I tried chatting up a couple, but they ignored me like a cherry cordial in a Whitman’s Sampler. Boats bob in the water off Soufrière, St. Lucia. If the accolades are to be believed, then St. Lucia, particularly the town of Soufriere, is the epicenter of Caribbean romance. As the love boat glided along the ocean, a rain shower created a rainbow in the distance. Couples quickly pulled out phones and starting snapping pictures of themselves. The captain took pity and offered to get a shot of me alone with the rainbow of romance. I felt like a human Carpenters song. She was the ice pick that cracked the couples clique for me. Those kids warmed right up once they realized I wasn’t some random creep. I was a creep from Boston with a name. 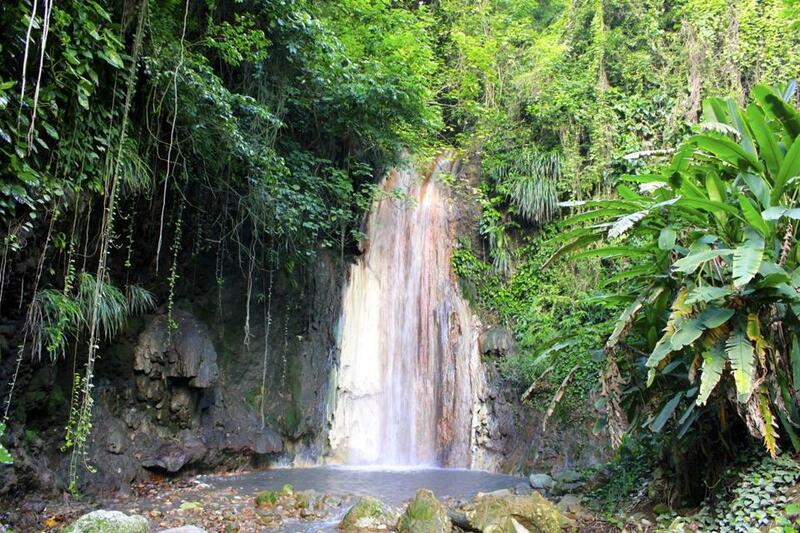 The waterfall at Diamond Falls Botanical Gardens in Soufriere. I wasn’t offended. OK, maybe just a scooch, but I understood their reaction. I was in a place full of bedroom eyes and bubble baths. My room at the Viceroy was a small bungalow with an outdoor jet tub and a bed romantically swathed in mosquito netting. It was gorgeous. I tried to convince myself that there was nothing weird about having a bathtub in the middle of a room only I was occupying. But I didn’t come to St. Lucia to linger in my luxurious, mosquito-netted bed, watch “The Nanny” on Netflix, and sip the local rum all day — although I’ll confess that I seriously contemplated it. I wanted to explore this paradise, and decided one of the best ways to do it was through the lens of my camera. I’ve owned an SLR camera (that’s tech speak for “fancier than a cellphone camera” or single-lens reflex) for about two years. During that time I’ve used it to take pictures of cats, sunsets, and more cats. Now I had a chance to learn how to use it properly. An increasing number of professional photographers offer tours that mix visiting local sights with lessons on how to take a decent picture. I signed up for a photo safari with a larger-than-life character named Kirk Elliott. He spent the first hour explaining the details of aperture, ISO, and shutter speed. I gamely tried to follow along. Our first stop was the center of Soufrière, away from the luxury hotels. I didn’t see any newlyweds, just locals going about their day. I attempted to use my camera lesson to capture the scene, meaning I chased a chicken around the town square trying to get a decent picture. When I glanced up, people looked thoroughly bewildered by my actions, as if there was something wrong with a grown man chasing a chicken around with a camera. “Are you hungry?” a woman asked kindly, gesturing to the bird. Elliott wisely spent the rest of the day taking me to scenic vistas, away from any fowl. The entire area is dominated by the Pitons, and after photographing them, I decided I would hike them the following day. 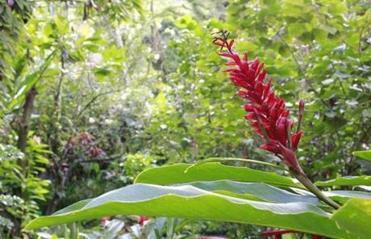 There are two, Gros Piton (2,530 feet) and Petit Piton (2,438 feet). There are no trail markers, so guides are necessary. I hired Charkar Attie of Treasure Tours to lead me up the mountain (there are a number of options for hiking tour guides). Naturally I chose Gros Piton. I’m far too butch to hike a mountain named Petit. Also, and more accurately, Gros (which means “big” in French) is not as steep as Petit, and therefore is easier to climb. My guide breezed along. I wheezed behind her. Occasionally, the skies would open and I was soon drenched in rainwater and sweat. The climb was difficult enough when the rocks were dry; when they were wet, the challenge doubled. By the end of it, my legs were noodles, but I was able to use my budding camera skills to get some stunning shots. I passed on the post-hike geothermal mudbath because I prefer the smell of bath salts to sulfur. Back at the bungalow, I climbed into that tub in the middle of the room, and pined to slip into bed with my good friend Bengay. Instead, I saw that the hotel was throwing a Black & White Party that night (suggested attire: black or white). I was determined that I would attend, and not feel strange that I was at a party by myself, reeking of Bengay. I stepped into the eye of the amative hurricane at the Viceroy’s Cane Bar, wearing my finest Johnny Cash black. I ordered a drink and used all my resolve to look as casual as possible. After a few Old Havanas — that’s aged rum, prosecco, floral bitters, mint leaves, and lime juice — I stopped feeling so afraid. I had every right to be in this aviary of lovebirds. I stumbled to the dance floor, brazenly stepped toward the center, and started moving. I had nothing to fear; I was invisible to the newlyweds. Or so I thought. “Hey, get over here and dance with us,” said one of my sunset cruise friends. It was not awkward, it was fun. I talked to new faces, stayed up far later than I should have, and realized that I wasn’t perceived as a weirdo on a romantic island. I was just an old-fashioned creep from Boston.